visualizes molecular distributions in living cells. enables pursuit of molecular dynamics in vivo. → long measurement time, a few to a few tens of minutes. 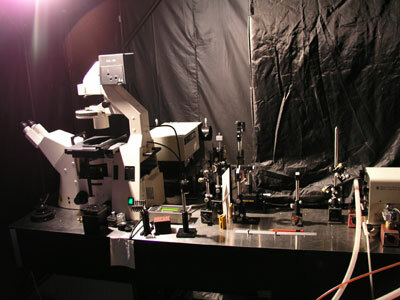 Laser beam is expanded at the sample point. 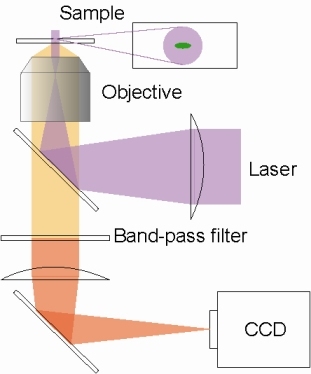 Raman scattered light is separated by a band-pass filter and imaged on a CCD detector directly. FIg. 5. 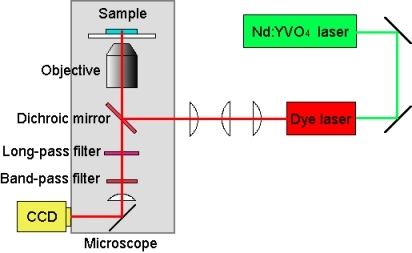 Optical image, and 649nm excitation (∼2900cm-1). Raman image with C-H stretch modes visualizes clearly not only the shape of the cell but also mitochondria which are rich in C-H bonds.